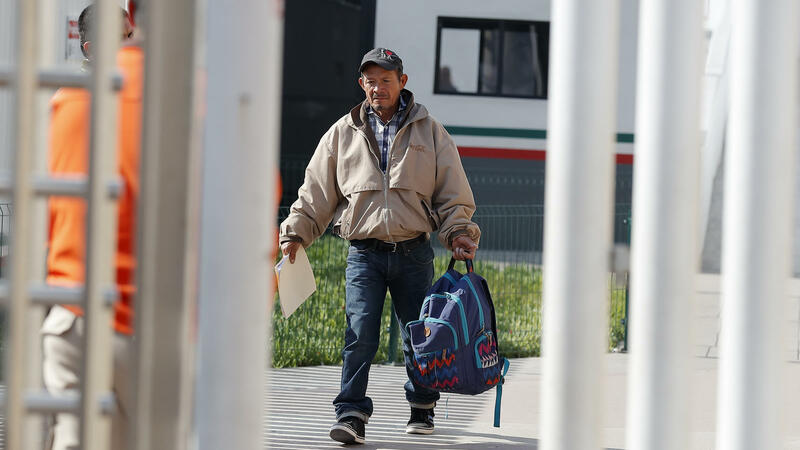 In late January, Carlos Catarldo Gomez of Honduras was the first person returned to Mexico to wait for his asylum trial date. The Trump administration announced on Tuesday that this program, dubbed 'Migrant Protection Protocols,' will expand from San Diego to Calexico, Calif. The Trump administration is expanding a hard-line immigration policy that forces asylum-seekers to wait in Mexico for their assigned court dates in the U.S. The program, which is officially known as the "Migrant Protection Protocols," began earlier this year at the San Ysidro border crossing in San Diego. Homeland Security officials say the program expanded this week to include migrants crossing at the Port of Entry in Calexico, Calif., and those apprehended in areas between official ports of entry in the Border Patrol's San Diego sector. Homeland Security Secretary Kirstjen Nielsen announced the program, initially dubbed "Remain in Mexico," in December. Administration officials say it's intended to deter the growing number of migrants fleeing the Northern Triangle nations of Guatemala, El Salvador and Honduras to seek asylum in U.S. immigration courts. The program was quickly challenged in federal court by immigrant rights advocates. They say it forces migrants to wait in dangerous conditions in Mexican border towns, and deprives them of access to lawyers to help prepare their asylum cases. For now, the vast majority of asylum-seekers are still allowed to remain in the U.S. pending their immigration court appearances. So far, only 240 migrants have been returned to Mexico under the program, according to immigration officials. That's a small fraction of the 76,000 migrants who crossed the southern border in February — one of the busiest months for the Border Patrol in a decade. "We are starting small to see how this process works," said a DHS official during a background briefing with reporters today. "Just to make sure that we have the coordination down with Mexico, and we have a process that works." There is no formal agreement with the Mexican government concerning the Migrant Protection Protocols, according to DHS. But U.S. officials insist there is coordination between authorities in the two countries. "We work very closely with the Mexican authorities," a DHS official said. "We're not going to open up a location that the Mexicans aren't ready and able to process, and provide the humanitarian protections that they agreed to do." A report earlier this month said the "Remain in Mexico" policy could soon expand to El Paso, Texas. DHS officials say they're working to further expand the program, but did not indicate when or where that would happen. Meanwhile, immigrant rights' advocates are going to court later this month in hopes of shutting the program down altogether. U.S. District Judge Richard Seeborg in San Francisco set a hearing for March 22 on their motion for a preliminary injunction. The case was brought on behalf of asylum-seekers and non-profit organizations that work with them by the American Civil Liberties Union, The Southern Poverty Law Center, and the Center for Gender & Refugee Studies.